The village of Caumont is located between the cities of Avignon, Cavaillon and l'Isle sur la Sorgue. The old town stands on the slope of a large hill, facing Durance river which delimit its southern territory. The recent archeological discovery of a rich roman villa attests Caumont as an ancient human settlement. The place is strategic, Caumont is close to on ancient ford across the Durance, named Bonpas, which permitted the crossing of the dreadful river. Agriculture is the prominent economical activity : vineyard on the hill slopes produce "Côtes du Rhône" wines as orchads spread in the Durance plain. The old village, build on the hill side was protected from the sudden Durance's floods. The church with its rising tower keeps the remains of the cardinal Philippe de Cabassole, Petrarch's great friend. The village still keeps its ancient look, and it holds some noteworthy monuments. The village, with its tortuous and narrow streets keeps its picturesque provençal look. Vestiges of the city walls still remain, of which the curious "porte neuve" from the 14th century. The church and its tower rising above the village is from the 17th century. Climbing up he hill allows to enjoy an outstanding view on the surrounding region : the Durance plain and the Sorgues country, and behind, the Vaucluse mounts, the mountain of the Luberon and the Alpilles. At the village edge, The chapel Saint Symphorien, built in the 12th century, is a rare example of style early romanic provençal. Below, a "Roman garden" has been designed where has been found the archeological remains of a rich roman villa. The "Chartreuse de Bonpas", 2 km east of the village is a listed monument, open for visits. It houses also a "Côtes du Rhône" wine maker. During archeological excavation, scientists discovered a large pool in a roman garden, actually the largest ever discovered in roman Gaul. Its dimensions are 65 m length, 3,20 m width and 1,20 m depth. It's a major archeologic discovery. The Roman Garden intends to remind us the luxuous roman villa and its wealthy garden which stood there 2000 years ago by creating a vegetal scenery. Near Caumont goes the "Via Domitia", a major roman road linking Italy to Spain. There were built a real country palace with a wealthy garden and an outstanding view on the Luberon mountains. The Roman Garden is open since July 2006. It is distributed in thematical gardens dedicated to gods and godess of roman mythology. An exhibition room presents the artefacts found during the excavation, evocative of splendour of the bygone Roman civilization. 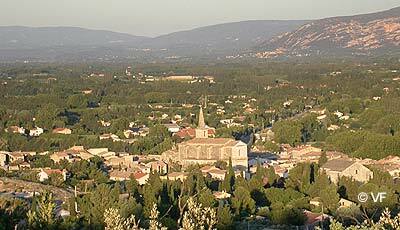 The town of Caumont-sur-Durance is located in the Vaucluse department. Selection of guest houses around Avignon on the portail of the bed and breakfast in provence. Caumont location : altitude 45 meters, 4600 inhabitants, 6 km from Thor, 10 km from Isle-sur-la-Sorgue, 20 km from Saint-Rémy-de-Provence, 24 km from Oppede, 25 km from Avignon.